A Tale of Two (Button) Movies…. 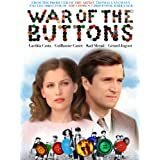 A friend of mine recently sent me a link to a movie called The War of the Buttons. 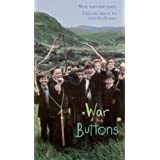 It’s about pre-WWII Irish boys who cut buttons off their rivals’ clothing. I looked it up on Amazon because I’d never heard of it and it looks pretty cool! I’m always amazed at how pervasive buttons are as symbols and motifs in art….and I’m anxious to watch these two movies and do a revew here soon! In the meantime, feel free to share if you’ve seen them!